Arduino libraries take a complex task and boil it down to simple to use functions. Arduino users have written lots of exciting add-ons for Arduino. For example, capacitive sensing takes difficult timing and pulsing of digital pins. We can write the code from scratch, or we can stand on the shoulders of great people who are smarter than we are. The myCapPad.capacitiveSensor() takes care of all the heavy lifting and the senseReading variable contains the value sensed from our capacitive pad. Libraries make complex tasks easier so that we can focus on larger projects. There are thousands of libraries out there! And luckily it’s pretty easy to install them. This tutorial will show you how to install a library in Arduino v1.0.5 but should apply for many past, present, and future versions of Arduino. Make sure you have a good understanding of the following concepts before getting any further into this tutorial. The Arduino website also has great instructions on installing libraries if you need more information for using the Arduino IDE's library manager, importing a *.zip library, and manual installation. When you open the Library Manager you will find a large list of libraries ready for one-click install. To find a library for your product, search for the product name or a keyword such as 'k type' or 'digitizer', and the library you want should show up. Click on the desired library, and the 'Install' button will appear. Click that button, and the library should install automatically. When installation finishes, close the Library Manager. Alternatively, if you have a library of your own you would like to add or a library that hasn't been added to the Library Manger yet, you can click the 'Add .ZIP Library' option, which will then allow you to choose a folder or *.zip file containing the library of your choice. Heads up! 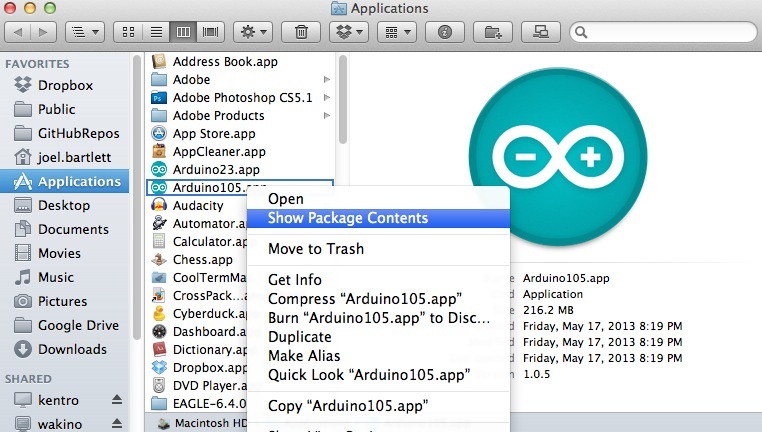 In previous version of the Arduino IDE, all libraries were stored together deep within the contents folder of the Arduino application. However, in newer versions of the IDE, libraries added through the Library Manger can be found in a folder named 'libraries' found in your Arduino Sketchbook folder. For more information on the Library manger, including deleting and updating info, visit the GitHub: Arduino - Library Manager FAQ. Now that the library is installed, an example sketch can be found in the 'Examples' submenu. 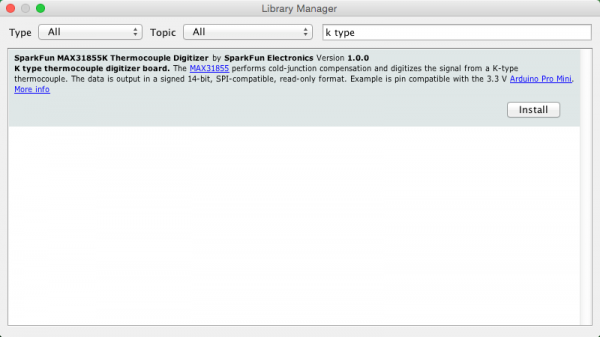 Since this is a relatively new feature of the Arduino IDE at the time of this writing not all SparkFun products will have libraries in the library manager. We are adding new products and working our way through older products over time. If you don't find the library you need in the manager or for some reason cannot install one of the modern IDE releases, follow the instructions in the following sections. This section covers manually installing a library under the Windows environment and utilizes quite a few screen shots. 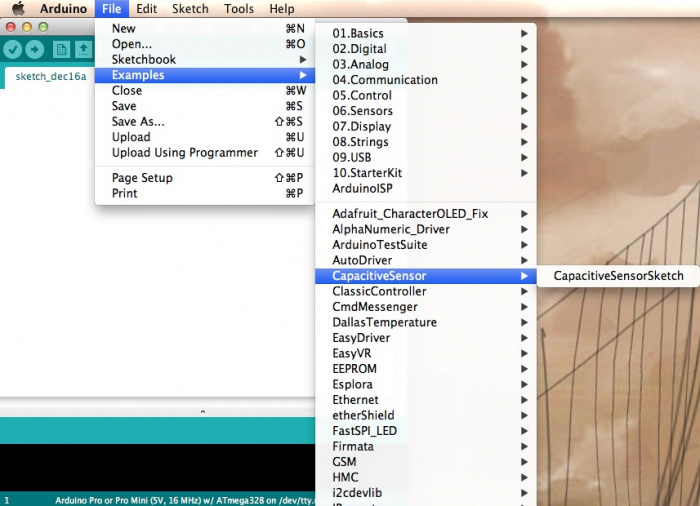 If you’re more of a text learner then check out the Arduino tutorial on installing libraries. We are going to use the Capacitive Sense library for this example. Navigate to the library’s page and download the zip file. Find the zip file on your local computer (wherever downloaded files end up). Under Windows, you should be able to double click on the file to open it up. This particular library contains libraries for both the basic Arduino and the more advanced Arduino Due. You can use both if you’d like, but, for this example, we will be copying and installing only the CapacitiveSensor folder. Libraries will usually contain a *.cpp file and .h file. Most will also contain an examples folder. 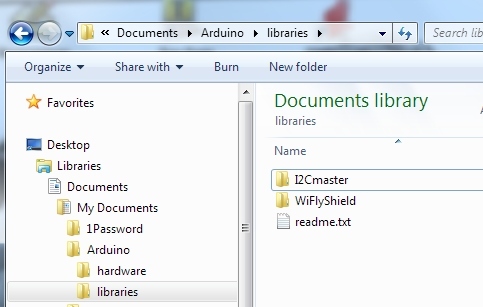 Under Windows, Arduino stores all the add-on libraries within the My Documents folder. Here we see the location of the Arduino libraries folder. Open an explorer window and navigate to the libraries folder under My Documents. 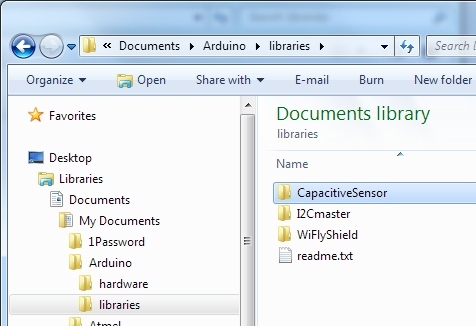 Now copy the new CapacitiveSensor folder to the libraries folder. Note: Arduino does not allow library folders to contain symbols such as hyphens ‘ - ’. Arduino will throw an error upon starting up. If the library you are installing has a funky folder name then this step is the ideal time to clean it up. To verify the library has been installed correctly, open up the Examples folder under the Arduino IDE. Wait. Where’s the CapacitiveSensor example? Did you have Arduino open when you copied and pasted the directory? Arduino checks the library directory at startup so if you already have Arduino open, you will need to restart Arduino any time you add to the libraries directory. 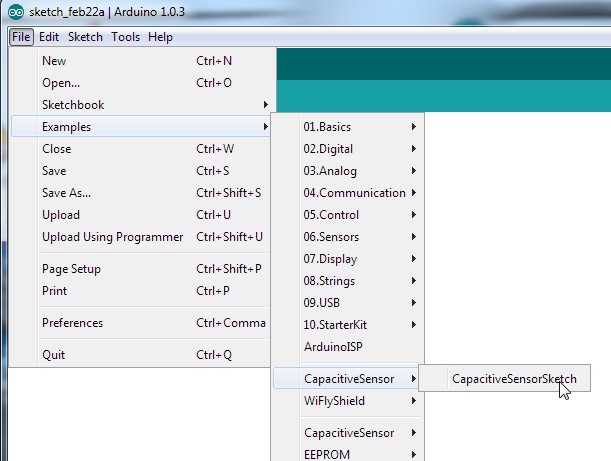 If you don’t see the CapacitiveSensor example try closing and re-opening Arduino IDE. There it is! Let’s open the example provided with our new library. Examples are the greatest thing about libraries! Good libraries will have well written examples showing how to use the library. These sketches are wonderful resources for example code and learning how to write good code under Arduino. You now have the Capacitive Sensor library installed! Feel free to start from the example sketch, or begin writing your own code using the functions provided by the library. A library usually has documentation either on its site or written into readme files and example code. In general, to quickly learn how to use a library check out the example code. This section covers manually installing a library under the Mac OS X environment. If you’re more of a text learner then check out the Arduino tutorial on installing libraries. Find the zip file on your local computer (wherever downloaded files end up). Unzip it, and look at the folder contents. 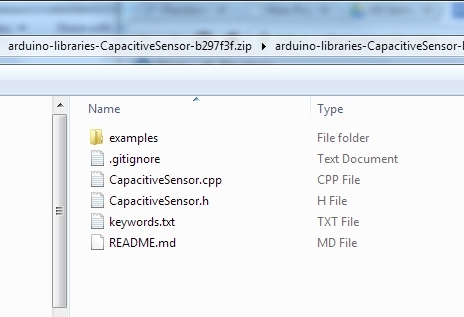 The contents of the Capacitive Sense zip file. Libraries will usually contain a *.cpp* file and *.h* file. Most will also contain an *examples* folder. Now we need to add this folder to the Libraries folder for Arduino. This folder is somewhat hidden in OS X. To get there you can do one of two things. Option one, right-click on the Arduino icon located in your Dock. 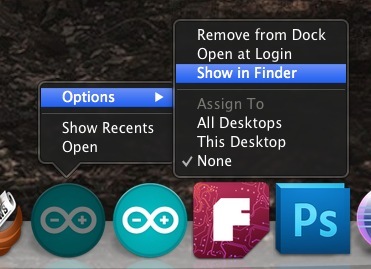 Go up to 'Options', then click 'Show in Finder'. 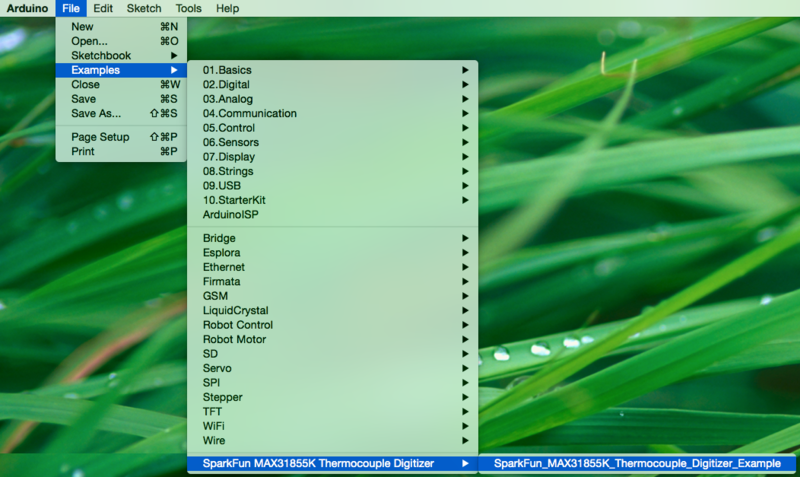 Option two, find the Arduino app located in your applications folder within Finder. 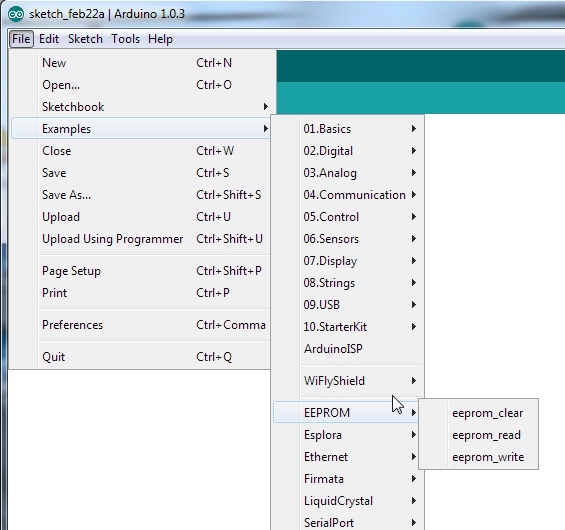 Now, right-click on the Arduino app, and select 'Show Package Contents'. Either option should get you to this point. Navigate through the following folders, 'Contents -> Resources -> Java', until you reach the 'libraries' folder. Note: If you don't have a libraries folder, simply create one here in this location. Inside the libraries folder is where you want to copy/move the library folder you just downloaded and unzipped. You'll also notice this is where all the default libraries live as well as any other libraries you may have installed in the past. Next, make sure that restart the Arduino IDE if it was open when you installed the library. This is a very important, often overlooked step. If you don't restart, the library you just installed will not yet be available to the IDE. To verify the library has been installed correctly, open up the 'File > Examples' folder under the Arduino IDE. TinyGPS is the gold standard for interfacing to GPS modules. SevSeg is a library we wrote to make controlling 7-segment displays easier. Sdfat is a very good library that allows you to read and write files to SD cards. Great for datalogging! Be sure to checkout all the examples included with the library. MP3Shield is a great example of a customer of SparkFun taking complex example code and creating a very good library to make the device easier to use. EEPROM is a built-in library that allows users to read and store settings within the non-volatile memory of the ATmega328. Very useful! 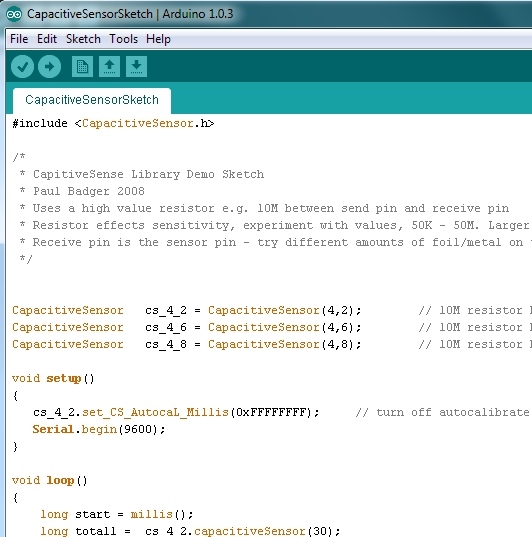 Capacitive Sensor is the library we covered in this tutorial. It’s great for non-contact capacitive switches and field sensing. Infrared Remote is a great library for reading signals from IR remotes and controlling IR remote based things like TVs and sound systems. Then you're using the Serial() library built in to Arduino. Arduino has quite a few built-in libraries. Here’s the list of the standard libraries that you can start using immediately! Once you’ve used a handle of different libraries, consider writing your own! Here’s a good tutorial showing how to write your own library so that you can help the world by making complex tasks a little easier. If you would like to have it included in the Arduino IDE Library Manager, make sure that your library fits the standards. Then submit an issue request for you 3rd party library in the GitHub repo for the Arduino IDE linked below. 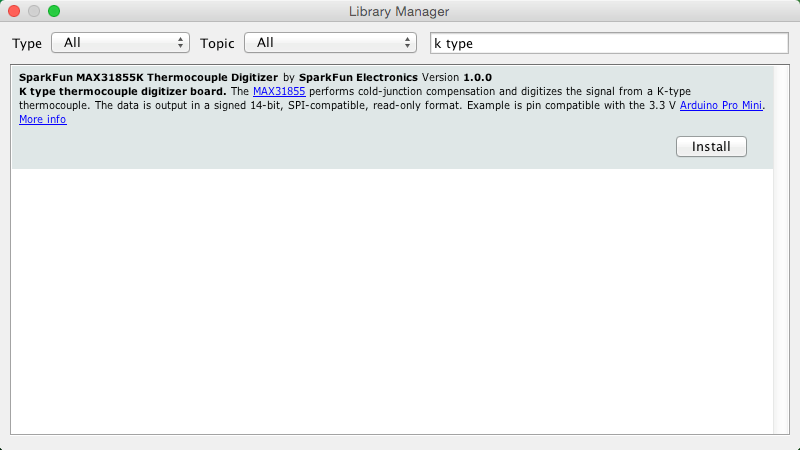 For an example of submitting a request, check out SparkFun&apos;s fingerprint scanner TTL library request. This tutorial will teach you what a bootloader is and why you would need to install or reinstall it. We will also go over the process of burning a bootloader by flashing a hex file to an Arduino microcontroller. Examining the diverse world of Arduino boards and understanding the differences between them before choosing one for a project.